This is the complete guide to help you choose the best SAD lamp of 2018. Whether you want something portable, powerful or adjustable or a blue light or a white light device take a look through my list of the best SAD lamps of 2018 to get something that could just change your life. A quick view of my 12 favourite SAD Lamps of the year..
Why Get A SAD Lamp? A few reasons why a SAD lamp might help you. In-depth reviews of my 12 favourite SAD lamps of the year. Light therapy and an ionizer! A huge number of studies, dating back to the early 1980s have been carried out on light therapy and one thing they all agree on is that it has a beneficial effect on those subjected to it. The pioneer of light therapy was Dr Norman Rosenthal. In the early 1980s he was at the centre of the first major controlled studies into its effects on people with SAD. The early studies showed that patients responded better to light therapy than could ever be imagined. Since then study after study has backed up Dr Rosenthal’s initial findings. 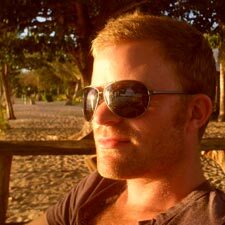 Most recently In 2016 a study of 122 people in Canada showed that light therapy was actually more effective in treating depression than Prozac. And SAD charity Sada say that 85% of people diagnosed with SAD who try light therapy report a successful hike in their mood. You sit around a foot or two foot away from your SAD light for around 30 minutes, preferably first thing in the morning during the darker months of the year. The lamp produces light that mimics sunlight. This bright light sends nerve signals to your brain, this in turn produces serotonin which improves your mood and appetite. The strength of SAD lights is measured in something called Lux. The recommended light intensity to treat SAD effectively is 10,000 lux. So ideally you want to look for this level. A lower intensity doesn’t mean the SAD lamp can’t be effective, it just means you might need to spend longer in front of it each day to feel the benefits. Check how close you need to be to the SAD lamp to feel the full benefit of the light, usually it is 10 to 12 inches, although some will still provide the full 10,000 lux when you are further away. SAD lights fall into one of two categories – the majority are white light, but a small number are blue light. Essentially the light the sun produces is a range of colors but looks white. Of these colors some have no effect on treating Seasonal Affective Disorder (red, for instance). Blue has proven to be especially beneficial to people suffering from SAD, hence why some companies have made blue light devices using only the blue spectrum of color. However the use of white light has been around much longer and is backed up with much more research than blue light. There is also concern that blue light could cause macular degeneration of the eyes. SAD lights are generally either full spectrum or broad spectrum. Full spectrum lights try to mirror natural sunlight as closely as possible and as such, like sunlight, they contain UV rays. Broad spectrum are as close to full spectrum as you can get, but without UV rays. Most companies use broad spectrum light bulbs to remove UV rays. Companies that do use full spectrum light generally have a diffuser screen to block the UV rays as much as possible. SAD Lights use different types of bulbs. For a long time incandescent or fluorescent bulbs dominated the market, but now LED bulbs have become more popular. However at the end of the day it is the quality of the light that is most important and all types of bulbs can be excellent. Can The Light Face Be Angled? You might want to consider if the light face itself can be angled or if it is restricted to one position. Being able to change the angle of the light means your sessions of light therapy should be more comfortable as you are not restricted to how or where you sit. Also studies have shown that light that enters the eyes from above is more effective at treating SAD. That is because it truly replicates the way your eyes receive sunlight naturally and also the special light receptors in your eye are generally found in the top half of your visual field. What Type Of SAD Lamp Do You Want? SAD lamps come in all types and sizes these days. A lot are desk lamps, some are full standing lamps that stand on the floor, some are wireless and most are generally lightboxes – recetangular shaped devices that can be placed on any surface and switched on. Think about how you will use it and if you need it to be portable. Timer – does the light have a timer? Lights with a timer can be more convenient as you set the time and the light will turn off automatically, meaning you don’t have to worry about it. Variable Brightness Settings – On some SAD lights you can adjust the brightness level. 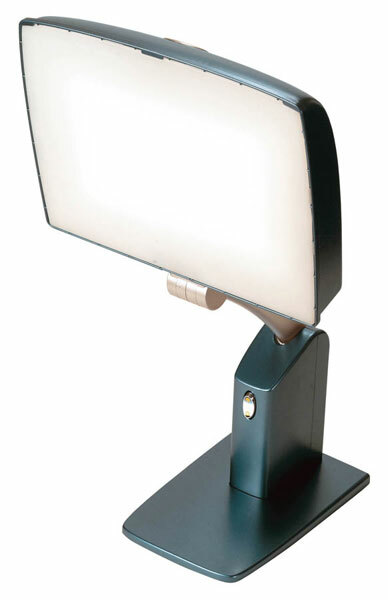 If you are new to light therapy or very sensitive to bright light this can be very useful. Light Surface Area – have a look at the size of the light area itself. A bigger light area means it is easier to receive light therapy. Budget – Of course you will have your own budget you will want to stick to. Those wanting a totally stylish and portable SAD light that is top notch! Verilux have a great reputation when it comes to SAD lights and the HappyLight Touch might just be their best offering, and that is say something! It weighs just over 1 lb and gives out 10,000 lux of light. It has three brightness settings and a timer you can set at one of four settings from 15 to 60 minutes. It comes with a three year warranty. There are lots of reasons to love this but the first one you will notice is just how slim and sleek it is. It is a sign of how far the design of SAD lights has come over the past 15 years or so. Because of its paper thin design it is just so easy to move and set up wherever you want. This makes it amazingly versatile and it is really easy and intuitive to use. Nice friction stand that keeps the lamp from sliding around the desk and lets you use it horizontally or vertically. Of course there are some downsides. With lights that are so thin and portable as this I always think it is sad that you can’t use it cordlessly, so it isn’t totally portable. In addition to that the cord is slightly short which restricts you a bit, but of course you can get an extension cord. Overall a top class addition to the SAD light field that has a lovely light, looks incredibly stylish, is so simple to use and could not be any easier to move around and store away. I love it! 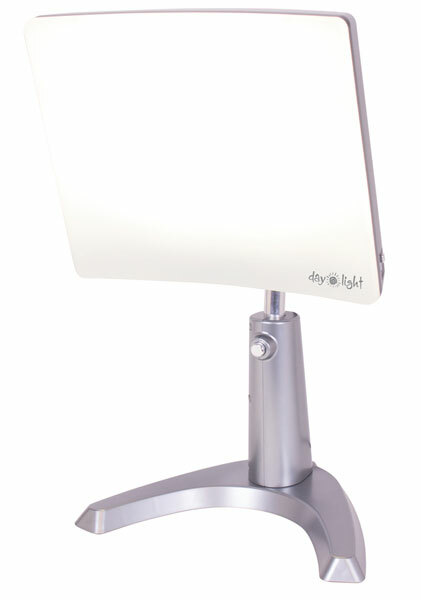 The Carex Health Brands Day Light Sky is quite simply one of the best SAD lamps on the market – exuding quality in all aspects. 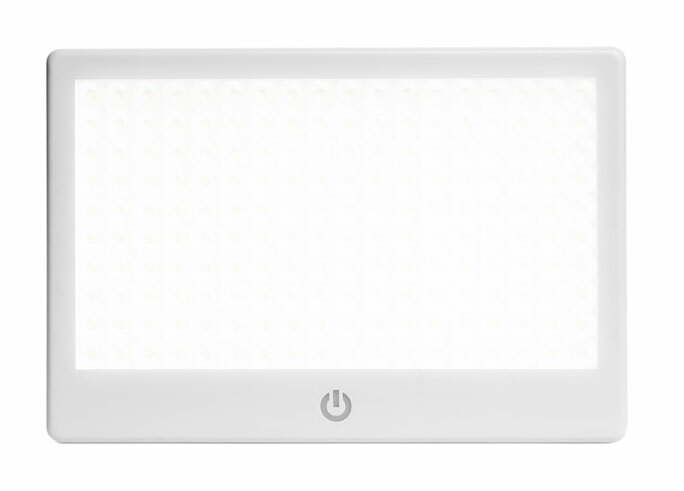 It gives of 10,000 lux of light from 12 inches and has two light settings you can switch between – 10,000 lux and 6,500 lux. The height and angle of the light face is adjustable with the light box area measuring 13.5 inches by 10.25 inches. It weighs 8.2lbs and comes with a five year warranty. One reason the Day Light Sky really excels is because its design means the units light hits your eyes from above, unlike many SAD light where the light enters from the side or even below. Having the light hit your eyes from above replicates the way sun enters your eyes in real life and many studies of SAD indicate this is the optimum way to receive light therapy. The light area, as mentioned, is 13.5inches by 10.25inches – a huge area of light which means even if you move around a little bit your eyes will always be in the field of light. The build quality is first class – it feels sturdy, well made and inspires confidence in you as soon as you turn it on. There is very little to complain about – however you should be aware this unit does have quite a large footprint and will take up a bit of space on your desk. The size of it makes it very slightly top heavy too – but not enough to worry that it will topple over. 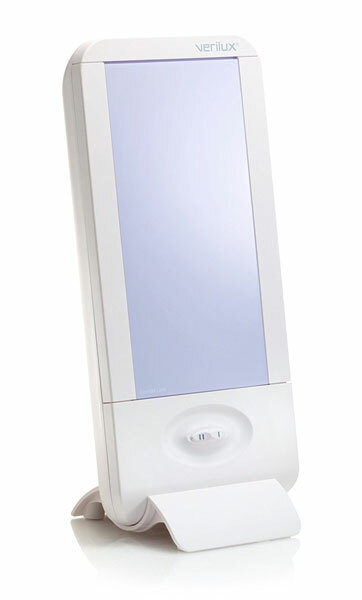 Overall this is absolutely fantastic – so easy to use might even start to look forward to your dose of light therapy! Those looking for a first rate SAD light at a reasonable price. The predecessor to the excellent Day Light Sky the Carex Health Brands Day Light Classic is another first rate SAD lamp in its own right. This offers 10,000 lux at 12 inches and has a 16 inch x 13 inch light area. It uses three 36 watt compact fluorescent bulbs and weighs 6.6lbs. It comes with a five-year warranty. As with the Day Light Sky there are lots of plus points with this, but its most attractive feature is the way the light sits above your eye level and the light shines down onto your eyes. This is the best way to receive light therapy as it stimulates the light receptors that are found in the top half of your visual field. Essentially it replicates the way sun would enter your eyes and studies have shown light therapy is far more effective this way. A nice big field of light – the light area measures 16 inches by 13 inches making receiving light therapy much easier and more comfortable for you. Great versatility – you can alter the legs and tilt the light box up to a maximum of 15 degrees. It even has a flip stand you can use to prop it up and a hole in the casing so you can hang it on the wall. The light quality is so nice that this actually makes an excellent lamp for general use not just for light therapy. It comes with a great five year warranty. On the downside whilst the legs are telescopic, they could be made a little more sturdy, as they are a bit flimsy, as long as you are careful you should be fine though. As with the Day Light Sky it does take up a reasonable amount of desk space so you should be aware of this. I think the Day Light Sky just has the edge on this, but it should be noted that is one of the best SAD lamps on the market and this runs it very close and is also a bit cheaper. If you want to save a bit of money and get a top class SAD light then get this! Those looking for a fantastic user experience. 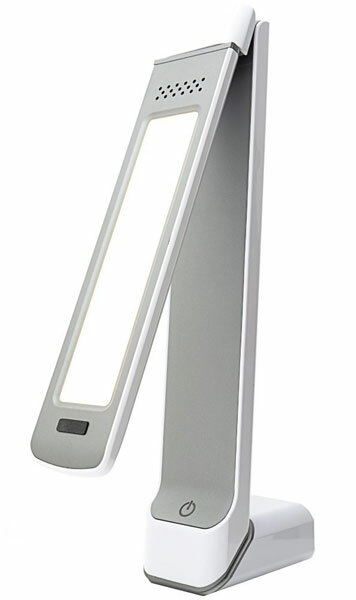 If you are looking for a SAD light with wonderful ergonomics and a lot of thought put into the user experience then look no further than the Aura Day Light Therapy Lamp. Weighing 2.2lbs and with a two year warranty, this emits 10,000 lux at 8 inches. It has an adjustable timer and a lux adjuster. It can also be tilted to position the light better. The wonderful thing about this is the options you have. At the bottom centre of the lamp is the power button. To the left of that are three options to set the timer for 10, 20 or 30 minutes. To the right of it is are three more options to set the timer to 40, 50 and 60 minutes. It is also quite unique in the fact it has a lux dial (that the manufacturers have patented) which you can switch to adjust the brightness to either 3,500 lux, 5,000 lux or 10,000 lux. On top of this you can angle the light to a 70 or 85 degree angle to make sure the light shines nicely in your eyes. The design and look is top notch, from the timer to the dimmer switch, to the sturdy stand and the large light area. It is worth noting that the fluorescent LED bulbs, which are quite expensive, are not covered in the warranty. Also whilst the timer feature is great, you cannot leave it permanently on – you can only operate it using the timer. But this ticks pretty much every box you could want from a SAD light – timer, adjustable brightness, tiltable light area and a nice design. No wonder everyone who uses it loves it! Those looking for something simple and effective. On the face of it the Lumie Arabica looks a little ugly in comparison to other SAD lights, but looks can be deceiving in this case as it is a truly wonderful SAD light. It gives out 10,000 lux at 11 inches and weighs 1.67kg. Its light comes from two 24W daylight spectrum bulbs that are recommended to be replaced every 2 to 3 years for optimal performance. It comes with a three-year warranty. The Arabica can really be summed up in two words – simple and effective! There is an on/off button which is on the lower front panel and a transparent guard you clip on which protects the bulb. Just switch it on and sit back and bathe in the light and the Lumie Arabica does the rest! The instructions are really clear and easy to understand – something that is not always the case with electrical goods. One thing I don’t like is that the push button switch to turn it on needs to be depressed quite firmly, so you had to hold it with one hand and steady whilst you push the switch with the other to make sure you don’t push it off your table. Alse the mains lead is a bit too short and it would be helpful if it was longer. But such is the beautiful nature of the light and the simplicity of operation it is easy to look beyond these shortcomings and see this for what it is – a genuinely top class SAD light that will definitely make a difference for you. Those looking for style and performance on a budget. The Circadian Optics Lampu could almost pass for a modern piece of art such is its stylish design, but it is actually a fantastic SAD lamp. It gives out 10,000 lux of light and comes with three levels of brightness. The light is full-spectrum and UV free. The bulbs are LED with a 50,000 hour lifespan and this comes with a three year warranty and weighs 1.4 pounds. As mentioned this is really well designed, looking nothing like a medical device and more like some art deco sculpture! It has a minimalist design which is actually based upon the sun, so you will notice lots of flowing curves and clean lines. The back is intricately detailed as well and all in all this is one of the best looking SAD lights out there. Of course there is no point it looking good if it doesn’t work and this as a really nice full-spectrum light that is pure white and with its 5500k color temperature it does a good job of mimicking the sun. The one touch adjustable brightness settings – there are three brightness settings, which is nice so you can tailor the strength of the light to your needs. The LED lights should last forever (almost!) and you get a great three-year warranty that covers both the lamp and adapter. It is really well priced, being almost right at the bottom of the list of all of the SAD lamps I have recommended in terms of price. It is a shame you can’t tilt the light face to help you angle the light better on your face and the on/off button is slightly recessed which does make it a little difficult to find and press on occasions. But in terms of size, weight, design and performance this takes some beating. Add in a great warranty and you are onto a winner! Those wanting the most powerful SAD light around. Want on reason to buy the Aurora Light Pad? Quite simply power – it is the brightest SAD light on the market! This weighs 0.56lbs and emits 10,000 lux. It has an adjustable stand and LED lights. It comes with a seven year warranty. Now like most other SAD lights this emits 10,000 lux, but unlike most other SAD lights you get the full 10,000 lux when you are 25 inches away from the light! Most SAD lights provide 10,000 lux if you are within 8 to 12 inches of the light but this one blows its competitors out of the water in that respect! 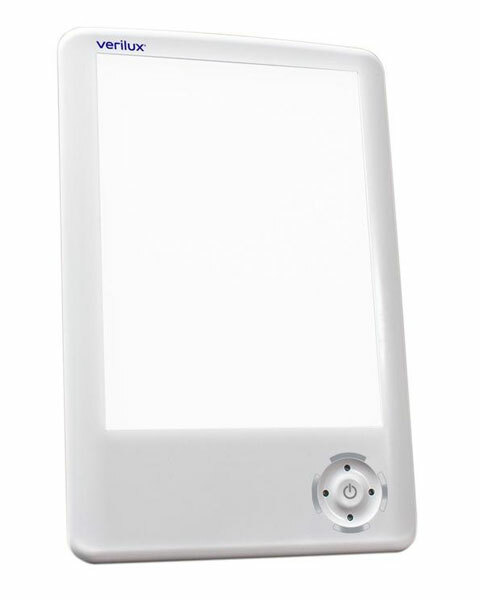 This makes it way easier to get your dose of light therapy as you don’t have to have the lightbox so close to you. It is so easy to set up and use. Due to the strength of this, if you are particularly sensitive to light you may find it too bright and struggle to cope with it. Also the cord is quite short, this is tempered by the fact you get the full 10,000 lux at 25 inches but a longer cord wouldn’t go amiss. Overall this is incredibly powerful, you won’t be fully prepared for the brightness of the light, but that means it works and it works very, very well indeed! Very, very, very powerful light! Those looking for a varying strength of lux. 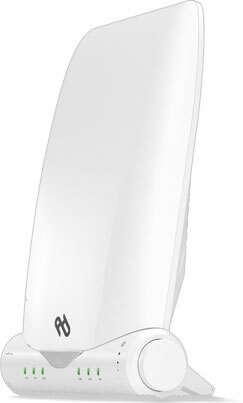 Compact, portable and incredibly versatile the Verilux HappyLight Liberty 10,000 is a brilliant SAD light. This comes with two interchangeable lenses and has two light settings. It uses natural spectrum fluorescent bulbs that give out 10,000 lux of light at 12 inches. It can be tilted backwards and forwards 15°, weighs 2lbs and comes with a one-year warranty. So you can really see that it effectively allows you to tailor the light to your exact needs if your SAD isn’t as severe as others. It has a lovely soft white light that isn’t harsh on the eyes at all. The downside is whilst this is reasonably priced, the replacement bulbs are only made by Verilux and are a bit pricey. Also it lacks a timer feature – which isn’t the end of the world but would be handy. If you want a smaller SAD lamp that is easy to use and provides a real variety of light then the HappyLight Liberty 10,000 is perfect – it will do a fantastic job. Those wanting true wireless portability. The Circadian Optics Lumos might just be the best truly portable SAD lamp on the market, with its sleek design and wireless operation. It gives 10,000 lux at 12 inches, and has three light intensities you can cycle between. It is battery powered and can also be powered through a USB port. It weighs 575g and comes with a three year warranty. The strength of the Lumos is really its complete portability. It is very small and compact and folds up into a tiny unit that is very slim and the easiest of any SAD light to transport. It uses a rechargeable 1800mA Lithium battery which has a really good battery life – lasting around 7 or 8 hours on a full charge. The light head can we twisted and turned to any angle thanks to the 180 degree vertical hinge and the 270 degree rotating light panel – basically allowing you to set up the light to shine in your eyes no matter where you are sitting. The three light intensities means you can use it as a every day lamp on the lower intensities. However the surface area of the light is relatively small, compared to other SAD lights and the base is slightly unsteady if you are not careful about how you position it. But in terms of wireless SAD lights this is pretty much as good as it gets and I love the fact it can be powered through a USB port if you want to use it as you use your computer. It looks really good and works really well too. Those looking for blue light therapy. 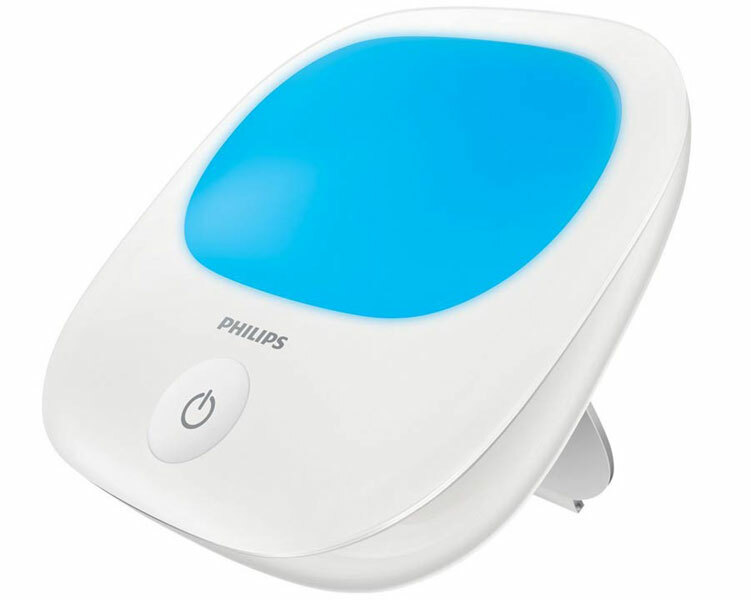 The Philips GoLITE BLU Energy Light HF3422 is my favorite blue light therapy lamp on the market – ticking all the boxes you need when you are looking for a SAD light. Research has proved that the blue bandwidth on the light spectrum is more effective at combating SAD – although there has been debate about this, which you can read here. The thing you might notice about the HF3422 is the design – I think it looks lovely and this is backed up by the build which is top quality and nice and sturdy – and incredibly easy to use. One small issue is that having one button is great in terms of making it easy to operate, but that also means to turn it off you have to cycle through all three light intensities before it goes off. It has a rear stand, but it is a shame this stand is not adjustable – that would making it easier to adjust the angle of the light. 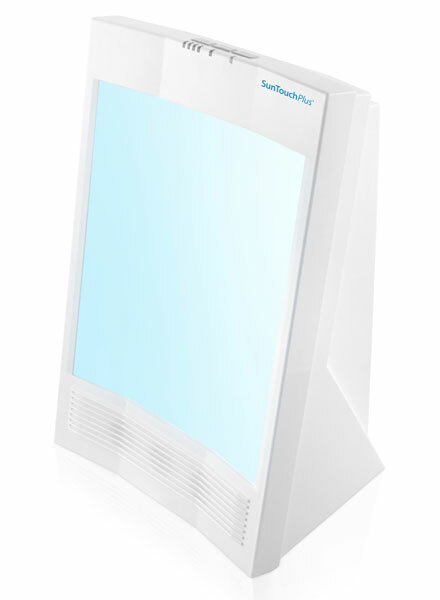 But it looks good and works well – if you are after some blue light therapy this is my favourite! Or if you want a cordless version and are prepared to spend a little more its brother the GoLITE BLU HF3429 is also pretty good. 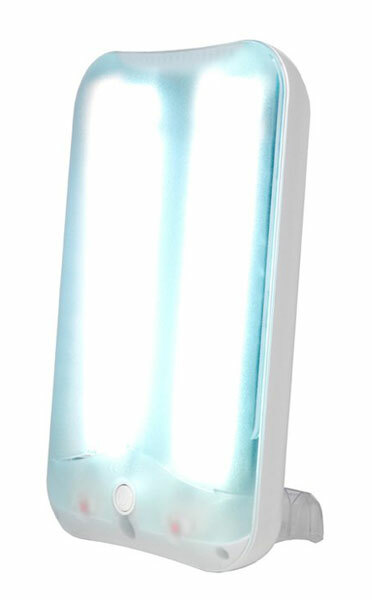 The Nature Bright SunTouch Plus Ion and Light Therapy Lamp is definitely the most unusual SAD light on this list! It gives 10,000 lux of light and has an adjustable timer you can set to 15, 30, 45 or 60 minutes. It uses 4 tubular fluorescent lights, weighs 4.15lbs and comes with a one-year warranty. Pretty standard so far right? Well it also has a built-in ionizer! So yes the big selling point of this SAD light is the ionizer which releases negative ions, these ions are meant to help alleviate the symptoms of depression and boost your energy. Nicely designed – has a carry handle and puts out a good amount of light but you can still move it around easily. It should be noted that whilst the unit is very reasonably priced – the bulbs do cost a lot of money if you need them replaced, almost the same price as the actual light itself! Also the Ionizer might not be for everyone. I loved it, but in my research there were a few people who didn’t like it. But you can turn it off independently of the light. All in all this is a really great SAD with the added bonus of an Ionizer that some people will really love. Oh and it is a complete bargain too! Those looking for a wearable SAD light. The Deluxe Feel Bright Light earns its place in this list not only for being a good SAD light, but for also being the world’s smallest light therapy device! This has two light intensity settings – 8,000 and 12,000 lux and will shut off automatically after 30 minutes. It uses rechargeable LED bulbs made to last 30,000 hours. It has a one year warranty and weighs 2 ounces. 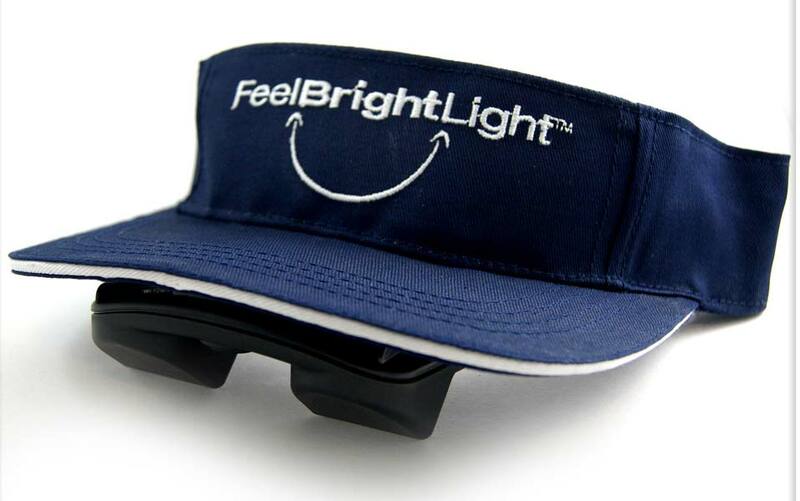 The difference with this is it is a wearable light therapy device, a visor with the light pointed from the visor into your eyes. So the size and portability of this are its two main selling points. What it essentially means is you can incorporate your light therapy into your daily routine. You can wear it as you clean, cook, get ready for work! In that respect it is a big time saver and means you aren’t limited to sitting down in a chair in front of a lamp. This weighs just two ounces – it is incredibly light! On the downside if you are self-conscious then this definitely isn’t for you – you won’t want to wear this is in public! It is also slightly top heavy with the light slipping down in front of your eyes unless you have it very well fastened. 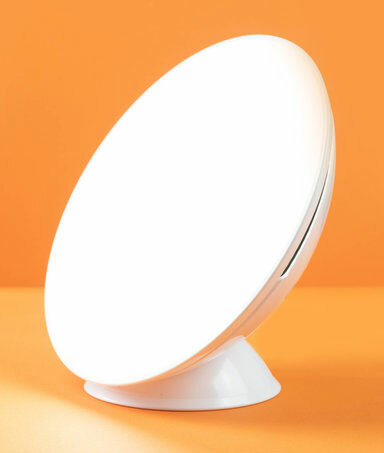 If you are after an ingenious SAD light to help you incorporate light therapy into your every day routine then look no further – it is small and powerful as well! The most portable SAD light ever! I hope you have found this rundown of the best SAD lamps of 2018 of use and there is something on this list to suit your needs. Don’t forget you can also look at my SAD Light Reviews Index for an overview of all my SAD lamp reviews on one page. Wow, I wasn’t even aware that a light like this was created. I do have a problem with depression. I don’t like taking my antidepressants. I was wondering if this will help with depression? Does your body absorb Vitamin D that the light puts off, though? Would there be no need to take Vitamin D supplements? Unfortunately SAD Lights don’t help create Vitamin D – you need exposure to natural sunlight for that. However using a SAD Light combined with taking vitamin D supplements could work wonders for you – so I would advise you go with that. Suffering from SAD affects many people and your website is an awesome response to that. With clear views and reviews that help us to make the right choice: buying a lamp and overcome our winter blues! The light is very helpful for children also… and there is a variety of lamps for kids. Thank you Almond, I appreciate your kind words. Yes I know of the work of Dr Lefebure – he did some groundbreaking work into light as you say. You should be able to get his lamp on the Luminoterapia website. I live in Alaska so I know all about the affects of long, dark winters! We go from endless light in summer (which I love but messes with people who are not used to it) to going days at a time without seeing the sun in winter since we go to work in the dark, miss the short daylight hours and then go home in the dark! You only get any chance at seeing the sun on weekends if the weather is nice and then it may be cold. I know I am affected by this lack of light in the winter since I dread the decline of day length every fall and eagerly look forward to the longer days in spring. I have been around SAD lights years ago when my parents used them but they seemed too intense to me. I am interested in these more modern SAD lights. I was interested to read that a SAD light should be positioned above the face. I have only seen them placed on tables so they are actually below the face. I would be interested to try this placement above instead. For that reason I think the Carex brand lights here may be good for me. I also like the look of the Nature Bright Sun Plus with a more gentle light and ionizer. Thanks for this great information on SAD lights. I need to try one this winter. Oh wow, I can only imagine what it must be like in Alaska in the winter (it is bad enough here in London!). Yes SAD lights have come on in leaps and bounds in recent years and there are several hints and tips for getting the most out of light therapy, but for me the positioning, above the eye line is most important for me. I love the Carex models and if you go for one of those I promise you won’t be disappointed. I hope they make the winter more bearable for you. Very interesting on SAD lamps. Should people also use these lamps during the warmer months or only the colder months? It’s nice knowing that it’s more effective than Prozac. The less drugs that people are on, the better. What is the average cost of these lamps? Also, are SAD lamps safe for kids to be near? Are they better for different ages and stages? Yes they are really only for the colder months – you shouldn’t need them during the summer. They replicated the sunlight you don’t get in the summer. The lamps cost anything from $50 upwards, but they are definitely worth the price. They are safe for kids to be near, but please use them in moderation if it is a child under 16. Thanks so much for this detailed, informative post on SAD and light therapy. Having grown up in Buffalo and now living in the Southwest, I’ve personally experienced the effect of sunlight and lack of it. Being able to enjoy the sun on a daily basis has made a huge difference in my well being. Currently, due to some health issues, I am not able to be outdoors as much as I like. So it is great to know their are so many sun light lamps to help. I didn’t realize there were so many options available. Your reviews were really helpful in showing the differences and benefits between the choices. I will definitely revert back to your list when shopping for my lamp to get the full benefit of having sunlight in my life. Thanks Debbie, if you are struggling to get outside as much as you would like then a SAD light is definitely for you. They are amazing things and can make such a difference to your mood. Winter is fast approaching though, so make sure you get your SAD Lamp fast! I am very curious about the SAD lamps. I was not aware of them before looking at your website. I am impressed with the new technology and the simplicity of the therapy application. I am in favor of a drug free environment and of keeping away from pharmaceuticals altogether. Your website is very thorough and provides a prospective shopper with all the information they would need to make an informed choice. Thanks. Thanks Bob, I am glad you found this useful, if you do have any questions please just let me know.